Norwegian Apple Pie is an easy to make apple cake-like dessert with a sweet apple flavor, and no fat! 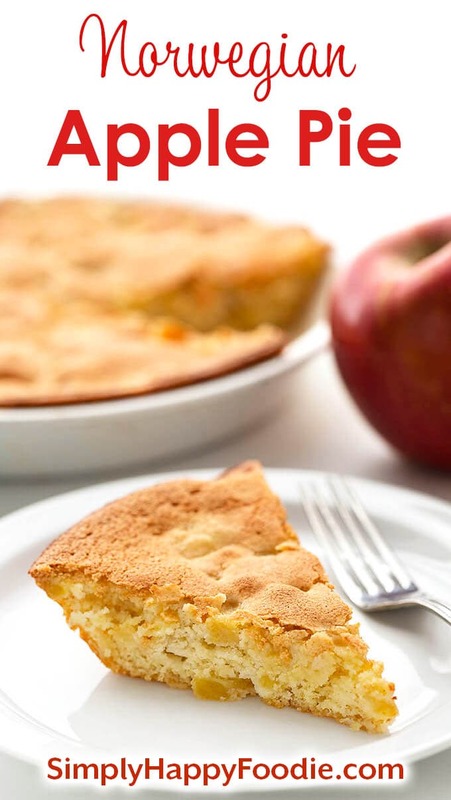 This apple pie recipe makes two 9″ pies, and is delicious! Let me tell you about Ruth Anderson. She was the head cook at a retirement home kitchen that I got my first job in when I was 15. Ruth could cook. Lemme tell ya, she had skills. Her repertoire was limited at the retirement home, but even so, she had some creative freedom, and often cooked her own recipes for those lucky residents! I was lucky too, because I got my meals as a benefit, and took full advantage of that perk! Ruth taught me a lot about cooking, and we talked all the time. I was her prep cook and her dish washer (MY GOSH did she use a lot of dishes & utensils!). I also set the tables, served, and bussed. I was friends with all of the residents. We were a close-knit bunch! Ruth told me that her mom used to say “It must have gone up the skimmer handle” when she’d lost something. She had many other colloquialisms she shared with me. Ruth was from Norway originally, and had married a Swede. Lots of fun stories about the family and all of the drama from her marrying a Swedish man (good humored drama)! When I met Ruth, she was a widow. One day she told me that she used to go to sleep with her head on her husband’s shoulder every night. That touched my young heart. So when I married Paul I was determined to do the same thing. The ‘Magic Shoulder’ is what he calls it, because I fall right asleep. Who wouldn’t, when you feel all safe and loved! Norwegian Apple Pie is Ruth’s recipe. I don’t know the history of it, but since it’s Norwegian it must have been a family recipe. 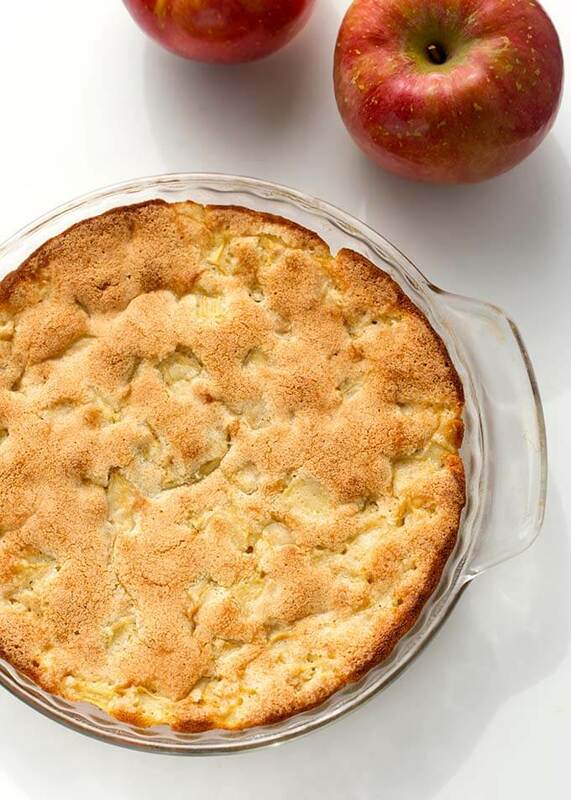 This pie is actually more like an apple cake, so you will be creating a batter. And it doesn’t have a crust. Norwegian Apple Pie is very sweet, and has absolutely no fat in it. No oil, butter, or any triglycerides in sight (except for buttering the dish). The batter comes together like a dough, of sorts. It looks like all of it should go into one pie pan to cook, but this recipe makes 2 pies, so just go with it! It rises pretty well and will go right to the top of the pie pan. I hope you enjoy this super simple and different variation of an apple pie! I think of Ruth whenever I make it. 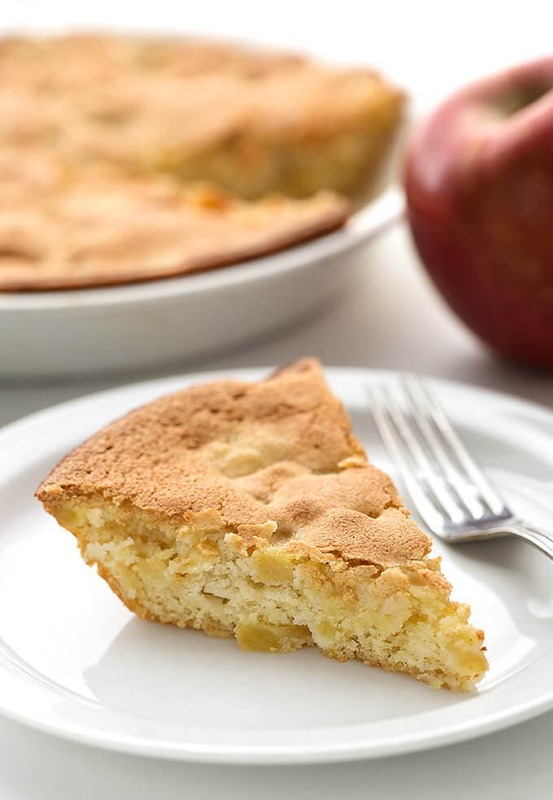 Norwegian Apple Pie is an easy to make apple cake-like dessert with a nice apple flavor, and no fat! Add eggs to a mixing bowl and lightly beat (by hand). Add sugar and vanilla and mix well. Add salt, baking powder and mix well. Add flour, mix well, but do not over mix. Divide the batter between two 9" greased pie pans. Spread the batter so it is even, and covers the entire bottom of the pie pan. Cool before serving, though it is good slightly warm, with freshly whipped cream, or vanilla ice cream. This pie will be lightly crisp on top at first, and will soften up and get more moist the longer it sits. For that reason, we eat it within a day or two as we don't like it to be too moist. Optional Ingredients: I have never made it with the nuts or raisins option, nor did Ruth when she made it with me. I think it could be very good. Please note that I guessed on the amounts for these options as the recipe didn't state any measurement for them. Can’t wait to make this recipe! I loved the story too! Nothing better than life in the kitchen!!! Hi Lisa, it’s such a simple recipe, and is really good. Do you recommend one type of apple over the others for this recipe? 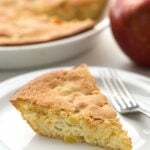 Hi Deb, if you want a little less sweet, try Granny Smiths as they are tart, and this recipe comes out pretty sweet. I have used all types of apples, and have enjoyed it every time. Does it make two pies? I’m going to dry it tomorrow, see how I like it, have company over. Hi Wally, yes it makes 2 pies. Enjoy! Do you know we have this wonderful pie in Hungary ??! We do use apples but we also do is change out the fruit depending on what’s available. You can use pitteded cherry, ripe peaches are amazing to. Tibor, that is so great to know! I want to try it with different fruits, now! Thank you for your comment! Dont we need any oil or butter? Hi Suzan, not in this recipe. Just spray the pans or grease them with butter, but no fat in the batter. It looks yummy but you can’t really say it’s “no fat” since there are 13.5 grams of fat in the three eggs. But certainly lower fat than conventional apple pie. Hahaha, true! I hadn’t though about the eggs. Love the recipes and your stories on the website, they truly do connect us with the Magic of Ordinary Days. This pie looks fabulous and because my dear husband is Norwegian, I want to make this for him soon. But since it is just the two of us – and this recipe makes two pies which get soggy fast, I want to know if the second pan could be frozen without becoming even more wet (like some frozen foods do). If the answer is yes, what would be the best way of freezing? Hi Julianne, I haven’t tried freezing these as they never last long. Maybe try making a half recipe, or just going for it and freezing one (please let me know your results!)? Thank you so much for your kind words, and I hope your hubby likes this pie! Hi, do you think blueberries could replace the apples. Hi Amber! I think blueberries would be really tasty, though they don’t have as much liquid in them as apples, so I don’t know how that will affect the batter. I would try it though because it will still taste good! Hi Anne! I’m so glad you liked this recipe! Ruth would be pleased! This is very similar to the recipe I use, except mine only uses whites and adds cardamom. Oh the cardamom sounds nice!